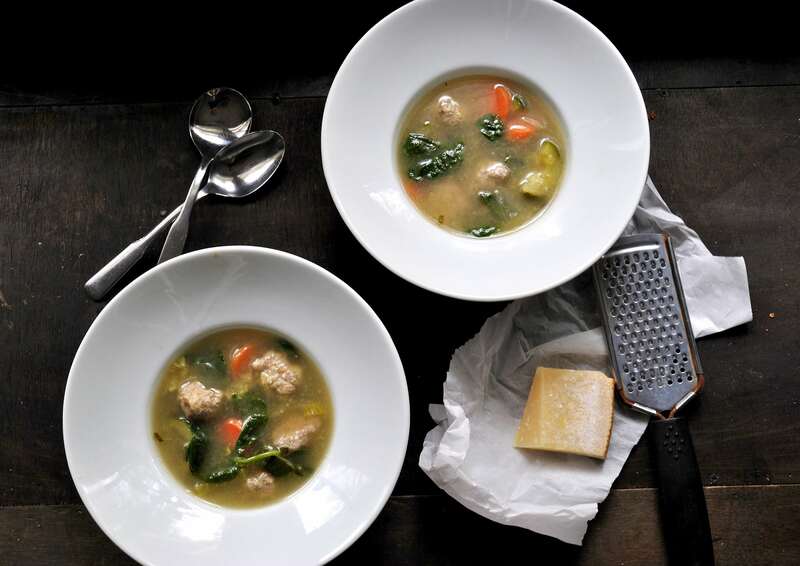 Fill your autumn days with a pot of hearty soup simmering on the stove. These flavor packed gluten-free recipes will warm the body on a chilly evening. Get your ladles ready – your family will want seconds. To make the meatballs, combine all meatball ingredients in a large bowl and mix until thoroughly incorporated. Divide mixture into tablespoon-sized meatballs (or larger, if you prefer) and roll into a small ball with your hands. Set aside. To make the meatballs, heat olive oil in a large nonstick skillet over medium heat.? Once oil is hot, add meatballs to pan ensuring that they do not touch.? Cook, without disturbing, for 5 to 7 minutes until browned. Flip meatballs and cook until browned on the other side. Once meatballs are browned, set aside on a plate lined with paper towels. To make the soup, heat 2 tablespoons olive oil in a very large soup pot. Once oil is warm, add onion and saut? until translucent. Add garlic and cook for 2 to 3 minutes, just until fragrant. Add carrots, celery and a small pinch of salt and cook until vegetables begin to glisten, about 7 minutes. Add zucchini, rosemary, oregano and thyme and cook for another 2 to 3 minutes. Add meatballs, bay leaf and chicken broth stock and bring to a boil. Reduce to a simmer and cook for about 20 to 30 minutes until meatballs are cooked through. Add spinach and Parmesan and continue to simmer another 10 minutes, until spinach is fully wilted. Season to taste with salt and pepper.? Serve and garnish with additional grated Parmesan.